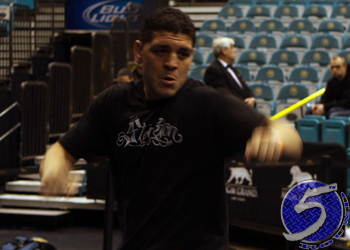 Nick Diaz apparently has a big problem with MMAFighting’s Ariel Helwani and his “instigating” ways. After Thursday’s “Strikeforce: Diaz vs. Daley” pre-fight press conference broke, the welterweight champ shared his feelings with the popular journalist, and much much more. While Diaz claimed he didn’t want to talk to Helwani, the controversial grappler went on an extended rant that covered a multitude of topics – sometimes coming within the same sentence. In regards to how the peeps from the 209 respond to instigators, “Where I come from, people like that get slapped,” Diaz said as he smirked into the camera. Diaz defends his 170-pound crown against Paul Daley Saturday inside the Valley View Casino in San Diego, California.